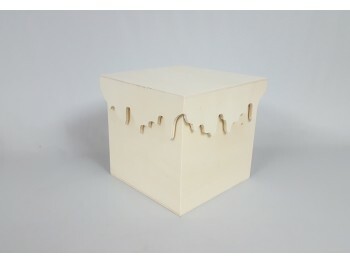 Poplar boxes with lid. Ideal for jewelery, soaps... Available in 3 sizes to choose from..If you want to add an engraving click the "Add engraving to this product" button and follow the instructions. . 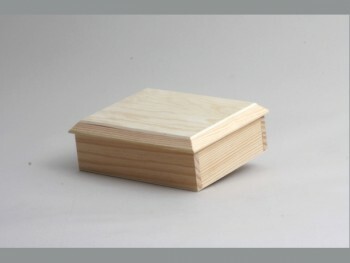 Box made of poplar with lid. Ideal for gifts, you can paint or decorate as you like..Measure - Interior of the box 18.5x18.5x9 cm..If you want to add an engraving click the "Add engraving to this product" button and follow the instructions. . 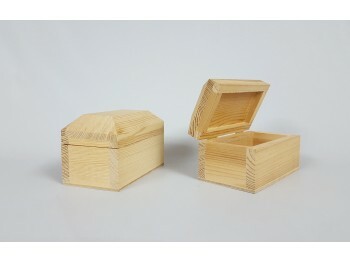 Boxes made of poplar available in 2 large sizes with lid, are very resistant. Ideal to make a delivery or gift..Internal measure - 23x23x10 cm. 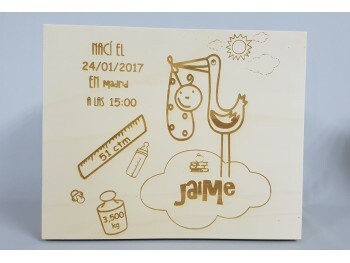 - 23x23x24 cm..If you want to add an engraving click the "Add engraving to this product" button and follow the instructions..
Cubic box with lid lace and handle to open and close easily. .Measure - Inside of the box 11.5x11.5x12 cm..
Large box to store toys or other objects. It has a lid and handles on 2 sides for easy transport..Measure - Exterior with lid 45x60x25 cm. 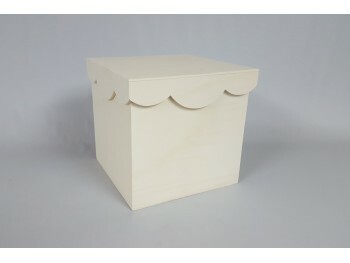 - Interior without lid 40x25.5x24.5 cm..If you want to add an engraving click the "Add engraving to this product" button and follow the instructions..
Poplar cube box with cut-out lid. Perfect for gifts..Measure - Interior without lid 18x18x19.5 cm..If you want to add an engraving click the "Add engraving to this product" button and follow the instructions..
Poplar cube box with cut-out lid in the shape of waves. Perfect for gifts..Measure - Interior without lid 22x22x22.5 cm..If you want to add an engraving click the "Add engraving to this product" button and follow the instructions..
Packaging type box with the lid fixed, easy to open and close. Perfect to give as a batch of various products..Measure - Interior of the box 33.5x25x9 cm.. If you want to add an engraving click the "Add engraving to this product" button and follow the instructions.. Round box bombonera made in poplar. Available in 2 sizes..Measure - Small Ø16 cm. and height 9 cm. - Large Ø20 cm. and height 11 cm..If you want to add an engraving click the "Add engraving to this product" button and follow the instructions.. Round pine box with lid. Available in 2 sizes..Measure - Small Ø6 cm. and height 3.5 cm. - Large Ø9 cm. and height 5 cm. . 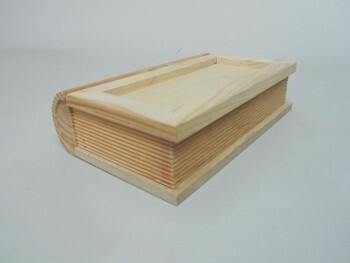 Box made of poplar to store the diapers of the smallest of the house. You can also hang up!.Measure - Outside of the box 32.5x25x16 cm..If you want to add an engraving click the "Add engraving to this product" button and follow the instructions.. Box natural pine wood basket with handle. Ideal for decoration and you can also paint it as you like;) Internal measurement 22x15x9 cm. Large napkin box made of natural poplar wood with hinges..Measure - Inside of the box 17,5x17,5x6 cm..If you want to add an engraving click the "Add engraving to this product" button and follow the instructions.. Box made of poplar, the lid closes in the shape of waves and has 4 legs. Ideal for storing pacifiers, it has an internal division..Measure - Interior of the box 18.5x8.5x10 cm..If you want to add an engraving click the "Add engraving to this product" button and follow the instructions. . 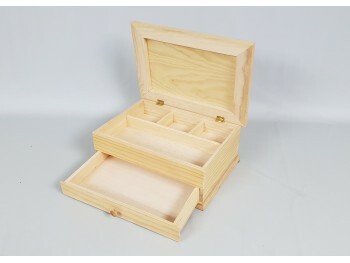 Box solid pine wood case with hinge and clasp, has 4 divisions inside that are removable. This box is perfect for belts, ties, tea bags ... The lid is glass so you can visualize the product..Measurements - Outside of the box 29x14x9 cm. - Inside of the box 26.5x12x7 cm. - Each hole 12x6x6,5 cm. . Wooden boxes without clasp.It has 25 removable divisions ideal for storing the Nespresso coffee capsules..Measure - Inside of the box 21x21x4 cm. - Hollows 4x4x2,5 cm..If you want to add an engraving click the "Add engraving to this product" button and follow the instructions.. Wooden box for 1 ballpoint pen or pencil, made of pine wood External measurement of the box 17,5x3x2,5 cm. Hollow for ballpoint long 15.5 x width 1.5 cm. Wooden box for pine for 2 pens or pens..Measure - Outside of the box 17,5x5x2,5 cm..If you want to add an engraving click the "Add engraving to this product" button and follow the instructions. .
Octagonal wooden box with lid..Measure - Interior of the box 14.5x14.5x10.5 cm..If you want to add an engraving click the "Add engraving to this product" button and follow the instructions.. Suitcase articulated sewing. It is very durable and is made of poplar wood, with 3 compartments. The two upper compartments are closed with a lid, while the rest will open by pulling the sides of the top.